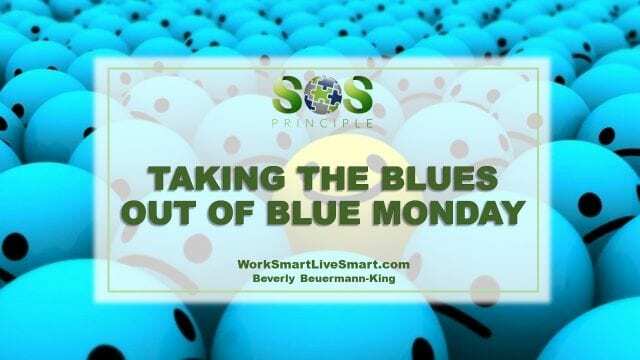 Taking The Blues Out Of Blue Monday - Work Smart. Live Smart. Blue Monday....the most depressing day of the year. The date was calculated by using many factors, including: weather conditions, debt level, time since Christmas, time since failing our new year’s resolutions, low motivational levels and feeling of a need to take action. where weather=W, debt=d, time since Christmas=T, time since failing our new year’s resolutions=Q, low motivational levels=M and the feeling of a need to take action=Na. 'D' is not defined, nor are units. This isn't a scientifically true formula, but it does point out several things that we already know. Our stress levels are impacted by many things such as negative weather conditions, lack of finances, unrealistic expectations and unmet goals. If all of these things come to a head at the same time, it certainly can make for a stressful or depressing time in our life. For some of us, Blue Monday may mean a lack of energy and motivation. However, we also know that some people really struggle with the winter blues and even Seasonal Affective Disorders around this time. Health Canada estimates 2-3% of Canadians suffer from seasonal affective disorder (SAD) and another 15% of Canadians suffer from a milder version simply known as the winter blues. SAD can be very serious, even prompting thoughts of suicide and death. Make it a celebration. Don't buy into the blues. Combat them by planning special activities at work or going out with friends. There is even a drink called "Blue Monday", complete with pina coloda mix, vodka, blue curacao, and pineapple juice, that is sure to bring images of sandy beaches and summer fun. Start planning a vacation. Even just looking at beautiful vacation pictures has a positive impact on our mood. Get outside. Go for a walk. Even if it is a snowy, winter's day, the benefits of getting a light break, beat staying indoors and moping around. Get you stressors under control. If you are worried about your finances, get to work building a realistic budget or connect with your company's EAP to see if they have someone who can point you in the right direction. There are many community and workplace resources to help you figure out life's issues. You are not in it alone, but you have to take the first step and reach out for help. If you think that you have moved beyond the blues to something more serious, talk to your doctor. Seasonal Affective Disorders and Depression are serious and can spiral out of control quickly. There are many treatment options available and the sooner you start, the better.